Located in the 4 acre grounds of Cliff House, the owners grade ll listed 18th century manor house, Holly Cottage is one of five cosy, stone and pantile cottages. All our cottages ( Holly Cottage sleeps 6, Beech Cottage sleeps 5, Lilac Cottage sleeps 4, Pear Cottage sleeps 2 and Apple Cottage sleeps 2) are clustered around the secluded gravelled courtyard and are all designed for privacy and comfort. The pretty Victorian walled garden provides an ideal place to relax after spending the day exploring the delights of one of the most beautiful locations in Yorkshire. Our orchard leads to an avenue of Italian cypress trees and lavender which in turn leads to our impressive orangery - perfect for relaxing whatever the weather. Holly Cottage has a large double aspect sitting room (with views over the gardens and grounds) with a roaring open fire, perfect for those chillier evenings, a large flatscreen TV with freeview, DVD and large comfy leather sofas. A spacious kitchen/dining room leads off the sitting room with a farmhouse style dining table and six chairs. The kitchen is fully-equipped with electric oven and hob, microwave, dishwasher, large fridge/freezer, kettle, toaster and cafetiere. A downstairs cloakroom and WC complete the ground floor. Upstairs there are three bedrooms, one double and two twin and the family bathroom with bath and electric shower over. Holly Cottage is equipped with a cot, highchair, stairgates and fireguard and lots of children's toys and books. Full gas central heating and off-road parking for 2 cars (further free parking available in the village) directly outside the cottage within the gravelled courtyard. Four acres of gardens with children's play area and tree-house provide the perfect place to let off steam. 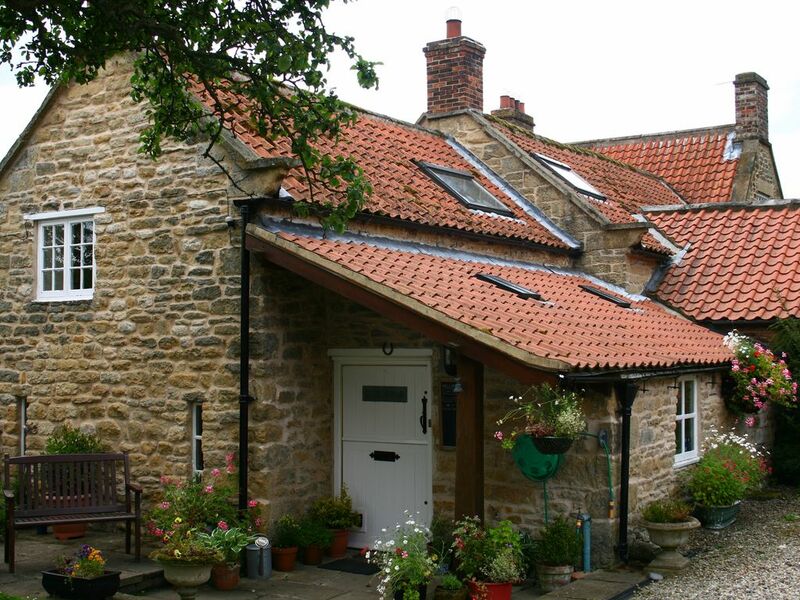 Perfect for the North York Moors National Park, market towns of Helmsley and Pickering and within easy reach of the rugged coastline and sandy beaches of Whitby and Scarborough. Flamingo Land theme park and Eden Camp wartime museum are 20 minutes away. The historic city of York is 30 minutes away by car. Ian and I moved to Cliff House in the pretty village of Ebberston in 2008 from another small village 10 minutes away, with our three children. We consider ourselves very lucky to be able to live in such a beautiful part of Yorkshire. When we are not busy preparing the cottages/welcoming guests etc. we spend most of our free time in the 4 acre grounds and gardens at Cliff House, so are always available for a chat or to offer advice on places to visit or recommend somewhere to eat. Located 100 yards down a quiet country lane, with private off road parking for each cottage within our secluded, gravelled courtyard, Cliff House Country Cottages, with 4 acres of grounds, is the perfect place to recharge your batteries. After an exhilarating day exploring the delights of one of the most beautiful locations in Yorkshire, relax and enjoy the excellent facilities at Cliff House - the indoor heated swimming pool and the games room. As we live in Cliff House itself, we offer guests a personal welcome and complimentary Yorkshire tea, coffee, sugar and a Yorkshire treat! Spacious bathroom with bath/shower over, WC and handbasin. Downstairs cloakroom with WC and handbasin. All bed sheets, pillows, duvets and duvet covers provided. Shared coin-operated washing machine laundry area. Shared coin-operated tumble dryer in pool building. Open fire. Complimentary basket of logs, firelighters and matches on arrival. Payable at cost thereafter. Parking for 2 cars within gravelled courtyard directly outside the cottage. One bath and one hand towel provided per person. Tea towels, oven gloves and dishcloths also provided. Very spacious, double aspect living room with 2 large leather sofas and armchair. Large flatscreen television with freeview, DVD and CD player. Open log fire. Several occasional tables and lamps. All crockery, cutlery, pots and pans provided. Spacious fully fitted and well equipped kitchen with large dining table and six farmhouse style chairs. Large fridge freezer, electric oven and hob, microwave, dishwasher and cafetiere. Large flatscreen TV with freeview. Large 4 acre grounds including orchard, Italian garden, orangery, woodland area with pond and stream, childrens play area with slide, sand pit and ancient yew tree tree-house some 20' high! Snainton golf centre is 1 mile away. Cliff House, the cottages and grounds are all grade II listed. Shared heated indoor swimming pool open every day 8am to 9pm. Closed Fridays 10am to 2pm for cleaning. Notes on accommodation: In addition to our superb facilities, all guests receive a personal welcome on arrival, along with detailed and informative welcome packs (and a Yorkshire treat!) to help you make the most of your stay. Please note all our cottages are no smoking and we do not accept pets due to livestock on some of our land. Outside: The heated indoor swimming pool is located next door to Holly Cottage in a purpose built building. It measures 24' x 12' and ranges in depth from 1 metre to 1.5 metres. It is open daily from 8am to 9pm, closing on Friday between 10am and 2pm for routine maintenance. The swimming pool/leisure facilities are exclusively for the use of resident guests only. The games room is located above the pool hall with table tennis, pool and darts (please bring your own darts). A coin-operated washing machine and tumble dryer are also situated in this building. The gardens amount to approx. 4 acres with children's play area, woodland, orangery and seating. We all loved holly cottage and the area in general so lovely and quiet yet only short drives to nearby busier places like Scarborough and Whitby. A very small thing is there is no WIFI which wasn’t really a problem for us but the kids would have liked it for at night when inside the cottage . But we absolutely loved it the pool is brilliant and the games room everywhere was very clean. Thank you for your review of Holly Cottage. So pleased you enjoyed your stay to celebrate your daughters 18th birthday. Great pool and superb gardens, although honestly disappointed with the interior of our holiday let. Considering the weekly rate I would not be prepared to book here again. Thank you for taking the time to review your stay in Holly Cottage. As you do not specify your concerns re the interior, it is difficult for us to comment. Perhaps the cottage did not suit your requirements as one of the children in your group was disabled and we state clearly on our advert that due to our grade ll listing status we are not suitable for disabled guests. You also arrived in a large van and were unhappy with the parking provision. If you had asked before your booking was made we would have advised that our parking area is not suitable for large vehicles and suggested that you look for more suitable accommodation elsewhere.. You selected to stay over the August bank holiday week and our prices reflect the facilities we offer, which you made full use of during your stay. Had a lovely time, peaceful surroundings. Thank you Tracy for your wonderful review of your stay in Holly Cottage. Thank you John and family for your fantastic review of Holly Cottage. Delighted that you all enjoyed spending Christmas at Cliff House and that the children enjoyed the use of our swimming pool. Thank you for leaving Holly Cottage beautifully clean and tidy. The sandy beaches at Scarborough are a 20 minute drive away. The rugged coastline of Whitby and Robin Hood's Bay are 30 minutes away by car. Flamingo Land theme park and zoo, North Yorkshire Moors Railway and Eden Camp wartime museum all within 15 minute drive. Dalby Forest for keen cyclists, walkers and nature lovers, and Go Ape for the more adventurous, just 3 miles away with direct access from the lane at the side of the cottages. Cliff House is a one minute walk to a regular bus route (hourly) into Scarborough or Pickering/Helmsley but a car is advisable. How to find us - Cliff House Country Cottages are situated in the village of Ebberston, just off the A170 between Pickering and Scarborough. From Pickering enter the village of Ebberston and pass the Grapes pub on your right. At the mini crossroads turn left. Cliff House is immediately on your right. Nearest shops are in Snainton (1mile) and Pickering (7 miles). Nearest pub is in the village, 50 metres from the cottages. There is an abundance of pubs, cafes and restaurants in the immediate area serving excellent food and a list of recommended places to eat is available in every cottage. Tesco and Asda both deliver to our cottages and many of our guests now order a supermarket delivery to coincide with their arrival day. This makes a stress-free start to your holiday and if it happens to arrive before you do we will even pack it away for you too! You can also have newspapers delivered to your cottage door from the Newsagent in the next village just in time for breakfast. Changeover Day: Normal changeover day in Holly Cottage is a Saturday. Three night short breaks start on Friday and four night short breaks start on Monday - short breaks are not available during our peak periods. Arrival time is after 4pm and departure time before 10am. During our quieter periods we can be more flexible with start dates. Notes on prices: Prices are per week, per cottage. No extras, price includes use of all our facilities, all bed linen, towels, heating and electric.